'Aside from Kermit, Miss Piggy and recent addition Walter, most of the troupe feel disappointingly underutilised, making this two films on the trot for several Muppet favourites'. In their usual meta style during the opening number of Muppets Most Wanted, The Muppets musically inform us that "everybody knows the sequel's never quite as good". A knowing reference, of course, to as many follow-up films as you care to mention, as well as wry self-deprecation of this film, the sequel to 2011's The Muppets. In the end, however, it's a joke which ends up as something of a self-fulfilling prophecy for returning director James Bobin, as Muppets Most Wanted struggles to achieve the satisfying levels of entertainment provided by the previous film. Where Muppets Most Wanted does at times come close to equalling its precursor, however, is through its musical numbers. Bret McKenzie is once again on songwriting duty, providing several catchy tunes that for the most part end up as the film's highlights. Particularly entertaining are the aforementioned opening song - aptly titled "We're Doing A Sequel" - as well as "The Big House", performed by Siberian Gulag prison guard Nadya (Tina Fey) and her inmates, and "I'll Get You What You Want (Cockatoo In Malibu)", sung by Kermit's nefarious doppelgänger Constantine. That said, there's nothing here to truly match the brilliance of The Muppets' "Life's A Happy Song" or the Oscar-winning "Man Or Muppet". At the opposite end of the scale, Miss Piggy's "Something So Right" clearly wants to replicate the sentiment of the previous film's endearing "Pictures In My Head", but ends up just feeling too bland and humourless. 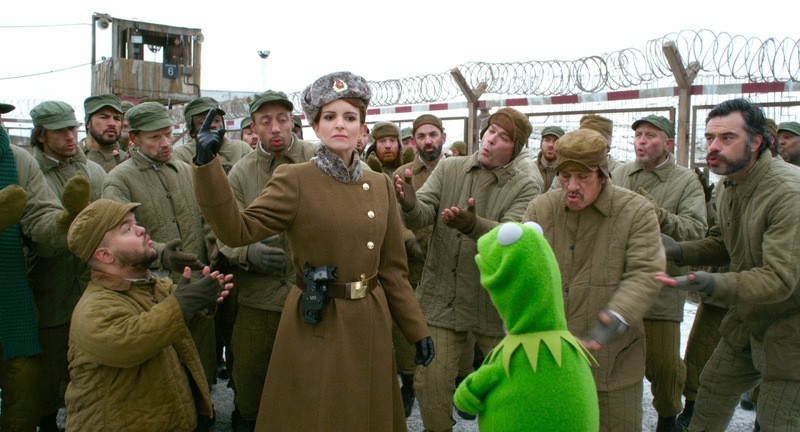 Away from the music, Muppets Most Wanted hits the mark about as often as it comes up short. The main plot - Constantine replaces Kermit whilst the Muppet head honcho is mistakenly thrown in prison - provides a fairly decent caper for the film to base itself around, even if it is shamelessly episodic with occasional strong echoes of previous Muppet films The Great Muppet Caper and The Muppets Take Manhattan. Constantine proves an entertaining villain, and even Ricky Gervais as his evil sidekick Dominic posing as The Muppets' new manager just about succeeds in keeping his ever-expanding ego in check. Regularly stealing the film, however, are agents Sam The Eagle of the CIA and Jean Pierre Napoleon (Ty Burrell) of Interpol, a duo who play off each other well and provide many of the biggest laughs. And, as with any Muppet film, there is fun to be had spotting the many, many big name cameos. What lets Muppets Most Wanted down the most, however, is its treatment of the puppet stars themselves. Aside from Kermit, Miss Piggy and recent addition Walter, most of the troupe feel disappointingly underutilised, making this two films on the trot for several Muppet favourites. The successful efforts put into making The Muppets seem relevant over a decade after their last feature film without rebooting them as such in The Muppets are largely squandered here, with Bobin regularly falling back on some very familiar and safe characterisation and ideas. Bobin's second Muppet film is ultimately an entertaining watch, even if the early tongue-in-cheek sentiment that sequels rarely match up to the original films is arguably proven to be true in this case. But there's a definite feeling throughout that it wouldn't have take a great deal more effort or ambition behind the scenes to move Muppets Most Wanted closer in quality to its predecessor.